We’re continuing our series through several of this year’s notable Commencement speeches. Last week, we looked at Stephen Colbert’s address to Wake Forest University. Today, we’re hearing from Ian McEwan, an acclaimed English novelist and screenwriter, who delivered a message to the graduates at Dickinson College. On the one hand, the students should be grateful for this era. There is likely more free speech, free thought, free enquiry on earth now than at any previous moment in recorded history (even taking into account the golden age of the so-called ‘pagan’ philosophers). And you’ve come of age in a country where the enshrinement of free speech in the First Amendment is not an empty phrase, as it is in many constitutions, but a living reality. But free speech was, it is and always will be, under attack – from the political right, the left, the centre. It will come from under your feet, from the extremes of religion as well as from unreligious ideologies. It’s never convenient, especially for entrenched power, to have a lot of free speech flying around. It’s helpful for McEwan to make his case by appealing to the common ground (he hopes) all will agree on, no matter our political or religious persuasion. That’s why it’s instructive that he issues this warning in a way that crosses these lines. It’s in danger from all sides, and therefore it must be protected by all sides. Why does free speech matter so much? Because “freedom of expression sustains all the other freedoms we enjoy,” he says. “Without free speech, democracy is a sham.” McEwan compares the Western world to free speech in other parts of the globe, or rather, the lack of it. He diagnoses the condition of free expression as “desperate” in many parts of the world, particularly in the Middle East, Asia, and in much of Africa. If “free speech” is prominent here but not elsewhere, why is McEwan devoting so much attention to protecting it? Why issue such a stern warning for Americans? It’s because McEwan sees how our political allegiances can blind us from the need to protect someone’s freedom of expression. 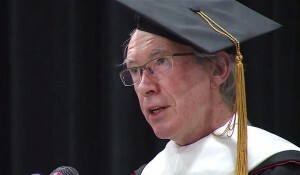 He calls this “bi-polar thinking” and then gives an example: “Let’s not side with Charlie Hebdo because it might seem as if we’re endorsing George Bush’s ‘war on terror’.” McEwan believes this to be a “suffocating form of intellectual tribalism and a poor way of thinking for yourself.” He mentions Ayaan Hirsi Ali, an ex-Muslim who is critical of Islam, who is unwelcome on many American campuses. Are All Beliefs Worthy of Respect? Islam is worthy of respect, as indeed is atheism. We want respect flowing in all directions. But religion and atheism, and all thought systems, all grand claims to truth, must be open to criticism, satire, even, sometimes, mockery. I believe there ought to be a distinction between respecting persons and respecting a person’s beliefs. Earlier in the speech, he mentioned the silliness of Holocaust deniers and yet articulated their right to free speech. Surely, he would not say that the belief that the Holocaust never happened is “worthy of respect.” Why then should we consider any system of belief or unbelief worthy of respect? Would we not do better to focus on respecting persons rather than positions? I do not believe Islam is worthy of respect. As a Christian, I see Islam as a false religion. If I believed Islam were true, I would be Muslim and not Christian. Even though I do not believe Islam is worthy of respect, I believe Muslims are worthy of respect, not because of what they believe, but because of who they are. They — like me, and every human being — are made in the image of God, and as image-bearers of God, they are worthy of respect. I agree with McEwan; I want “respect flowing in all directions,” but I’d qualify that as being respectful toward persons, not considering all beliefs as “worthy of respect.” I believe the Holocaust denier is worthy of respect as a person; I do not respect his appalling views, even if I believe he has the right to them. It can be a little too easy sometimes to dismiss arguments you don’t like as ‘hate speech’ or to complain that this or that speaker makes you feel ‘disrespected.’ Being offended is not to be confused with a state of grace; it’s the occasional price we all pay for living in an open society. The dismissal of arguments is something that has been going on for quite a while now. At times, it has been a tactic of the right; today, it is often displayed on the left, as Kirsten Powers’ new book documents so forcefully. Overall, I believe McEwan’s speech to be a strong reminder of just how important free speech is for a free society. We do not seek to maximize free speech by perpetually offending people. Instead, we welcome the opportunity to be “offended” by someone’s free speech; it is a gift to be cherished, a reminder of the precious and beautiful right we have inherited. It may be awkward at times, inconvenient, and sometimes offensive, but the freedom of expression is one of the hallmarks of Western civilization.